New Delhi: Plans by the Congress-led United Progressive Alliance (UPA) to put in place an anti-corruption legislation may come unstuck as the ruling coalition came up against resistance from its own allies in the Rajya Sabha. Late on Thursday night, the Congress was struggling to secure passage for the Lokpal Bill in the Upper House as the Trinamool Congress (TMC), a key member of the ruling coalition, the Bahujan Samaj Party (BSP) and the Samajwadi Party (SP) refused to back parts of the Lokpal and Lokayuktas Bill, 2011, which seeks to create anti-corruption ombudsmen at the centre and in the states. The debate was still continuing in the Rajya Sabha at the time this edition went to the press. Several rounds of talks between Congress leaders and those of TMC, the BSP and SP failed to forge a consensus on the legislation that opposition groups and political analysts said was flawed. The BSP and the SP have in the past supported the UPA from outside while not being part of the coalition. The proposed law, which was passed by the Lok Sabha on Tuesday, provides for the establishment of a nine-member Lokpal (including a chairperson) at the centre and Lokayuktas for states. The ombudsman would be empowered to inquire into “allegations of corruption against certain public functionaries". The Bill brings under the Lokpal’s ambit the prime minister (with some riders), members of Parliament and senior civil servants. It keep the Central Bureau of Investigation (CBI) and the lower bureaucracy from outside the direct control of Lokpal. The TMC, headed by West Bengal chief minister Mamata Banerjee, which supported the Bill in the lower House, is resisting clauses contained in the Bill on the formation of Lokayuktas, asserting that it would encroach upon the autonomy of states. If the amendments are passed in the Rajya Sabha, the Bill will have to go back to the Lok Sabha for its consent, making it impossible for the anti-corruption Bill to become law in this session. 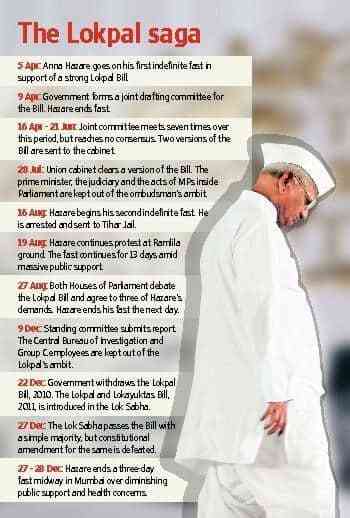 The Lok Sabha, which had an extended session, was adjourned indefinitely on Thursday. Some analysts said the Congress had failed to carry along its allies on crucial aspects of the legislation, making it difficult for them to support the Bill. In the Lok Sabha, abstentions by allies and opposition from the Bharatiya Janata Party (BJP) had led to the defeat of a separate Bill proposed by the government to confer constitutional status on the Lokpal. Finance minister Pranab Mukherjee, the key government negotiator on the Lokpal legislation, met BSP and SP leaders separately. According to a Congress leader, who requested anonymity, Mukherjee has offered to drop the portion of the Bill that deals with state Lokayuktas. Initiating the debate in the Rajya Sabha, leader of the opposition Arun Jaitley slammed the Bill, saying it would lead to “constitutional havoc" as it could encourage the centre to “usurp" the rights of states through the provision of setting up of Lokayuktas. “This law is vulnerable to constitutional challenge... If you are creating history, let us not create bad history," the senior BJP leader said. “We’ll be leaving a lot of tasks for the next generation to do... You are creating a Lokpal so that it becomes a rudderless institution." Countering Jaitley’s arguments, the Congress party’s Abhishek Singhvi argued that Parliament has the powers to make laws for the whole of the country. The Bill has not made anyone happy, said Pratap Bhanu Mehta, political analyst and president of the Centre for Policy Research, a Delhi-based think tank. “It does not make the regional parties happy, it does not make even those happy who say that the Lokpal should not be all powerful, the Bill does not solve the core problem (corruption)... Yet it creates a potential logjam in Parliament," Mehta said. “The biggest problem the Congress had was that it has not convinced anybody that it is sincere," Mehta said while commenting on the floor management of Parliament by the UPA government. “The issue is that they (political parties) are caught between a rock and a hard place...no party wants to come across as being seen opposing the Lokpal Bill. Every political party here is doing politics of bad faith." 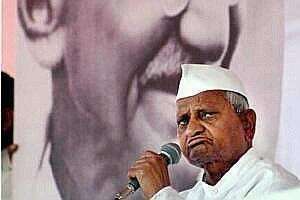 Anti-corruption activist Anna Hazare, who had called off his three-day hunger strike on the second day in Mumbai on Wednesday, owing to diminishing public support for his campaign and ailing health, returned to his village, Ralegan Siddhi in Maharashtra. He has renewed a threat to campaign intensely against the Congress in five states—Uttar Pradesh, Uttarakhand, Punjab, Manipur and Goa—that are going to the polls in February-March.